San Luis Obispo County, May 26, 2016â€”Hike to the top of beautiful Irish Hills just moments from downtown San Luis Obispo, kayak blue waters in the quaint fishing town of Morro Bay, or traverse pristine coastal sands on an ATV in Oceano/Grover Beachâ€”all within a single day trip or weekend excursion to San Luis Obispo (SLO) County. Located midway between Los Angeles and San Francisco, this naturally gorgeous getaway is as enticing as it is convenient to reach. Nowhere else in California does the combination of blue skies, sunny days, and exhilarating outdoor activities come together with such diversity and abundance. 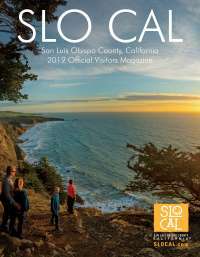 Whatever your outdoor pleasure, youâ€™ll find it in San Luis Obispo County. Explore 80 miles of coastline by surfboard or foot. Discover tide pools while horseback riding through breathtaking MontaÃ±a de Oro, kayak the historic Dinosaur Caves in Pismo Beach, or paddle board through Morro Bay, alive with seabirds and seals. The kids will enjoy a truly hands-on experience at Avila Beachâ€™s Central Coast Aquarium, not far from Avila Hot Springs, a choice spot for relaxation amongst the oaks. Whiz by crashing waves at the Oceano Dunes, a thrilling adventure for the adrenaline junky in all of us. Seekers of the classic California beach town experience will revel in all that Pismo Beach has to offer, including a booming surf culture and famous clam chowder. Continue along Highway 1 to Cayucos, offering up a secluded escape dotted with antique stores. To the North, youâ€™ll find Cambria and San Simeon, home to Hearst Castle, quiet beaches, and unforgettable sunsets. Soar high above a patchwork of wilderness and grape vines with one of Margarita Adventuresâ€™ many exhilarating zip lines, or stay grounded and traverse more than a dozen hiking and mountain biking trails that loop across San Luis Obispo Countyâ€™s pristine terrain. Want to cycle off the beaten path? Hop on your road bike and explore the dusty back roads of Paso Robles Wine Country, where the sweeping vineyard scenery is as striking as the epicurean offerings. Not sure about bringing Fido? San Luis Obispo County welcomes your dogs with a plethora of canine-friendly options, including Atascadero Lake park, near the Atascadero Zoo. Spread a blanket on the grass, enjoy a family barbecue, and throw the Frisbee for your four-legged friend. Test your obstacle course skills at the Vista Lago Adventure Park at Lopez Lake in Arroyo Grande where the whole family will zip by on four zip lines totaling more than 2,100 feet and a 40-foot free fall called Quick Jump. If water sports are your kind of fun, youâ€™ll want to grab the whole family and head out for San Luis Obispo Countyâ€™s exciting lakeside offerings. Jump on a jet ski at Lake Nacimiento to the North or embark on an inner tube ride at Lake Lopez to the South, where boating is big. Love a good game of golf? Hit the links at ten diverse courses located throughout the region, each offering its own natural beauty and skill level. Horseback riders will find a range of opportunities to saddle up, including at MontaÃ±a de Oro State Beach, known for its golden hills and epic tide pools. For more information on how you can explore the great outdoors in San Luis Obispo County, visit www.visitsanluisobispocounty.com or book your lodging today at www.visitsanluisobispocounty.com/lodging.